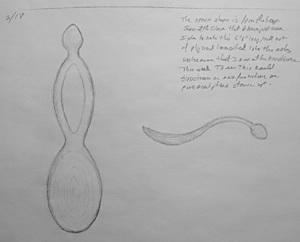 The idea for the Great Spoon came to me after viewing an African art exhibit, "Art of the Lega" at the UCLA Fowler Museum of Cultural History in Los Angeles. I was fascinated with the display of ceremonial spoons and made this drawing the next morning. I had also seen the H. C. Westermann exhibit at the Hirshhorn Museum in Washington, DC and was impressed with the artist's use of stacked laminated plywood sculptures. I thought this construction method would be the perfect way to scale up a 5 inch spoon to a 5 foot Great Spoon. The inscription on the drawing reads: "The spoon shape is from the Lega show at the Fowler that I have just seen. I plan to make this 5' 6" long/tall out of plywood laminated like the Westermann that I saw at the Hirshhorn this week."